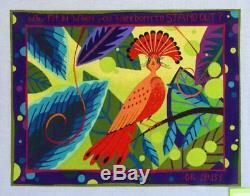 Zecca "What Fit In When You Were Born To Stand Out" Hand Painted Needlepoint Canvas 18 ct. This hand painted needlepoint canvas is on 18 ct canvas with an approximate design size of 13 1/2 X 17 1/2. This hand painted needlepoint canvas is created by Zecca Designs. The item "Zecca What Fit In When You Were Born To Stand Out Hand Painted Needlepoint" is in sale since Tuesday, January 22, 2019. This item is in the category "Crafts\Needlecrafts & Yarn\Embroidery & Cross Stitch\Hand Embroidery Cloth & Canvas\Plastic Canvas". The seller is "miller85614" and is located in Green Valley, Arizona.